An earlier version of this post was published prior to it being finalized…My apologies for that…Here is the final edition. Our 2 middle boys (Aaron/22 and Ethan/20) are back from spring break. And, oh what an amazing experience they had! As outlined in a prior post, they visited San Francisco to attend a Dale Carnegie training program: How to Win Friends and Influence People, in Business. And, to spend some time touring that beautiful city. Due to the hands-on nature of the class there were only 11 participants, which provided for great / personalized training involving much role playing in addition to lecture. The other 9 participants were men aged 40+, and were obviously “encouraged” by their employer to attend this training because they are (were? ), let’s just say, seemingly difficult to get along with. Regardless, the boys hit it off with them. After training ended one day another participant asked the boys if they needed a ride back to the hotel. He happened to drive a brand new Tesla. If you are not aware, a Tesla is a completely electric, very powerful, high-end luxury car. The boys jumped at the opportunity. When they went on the highway their new friend floored it and they were sucked back into their seats by the g-force. Amazingly, due to it being an electric car, there was NO SOUND. This vs. the roaring sound one hears when flooring a high-powered traditional vehicle. Cost of the car: over $100k. Not “yet” practical for the average American. Finally, on their day off they rented bicycles and pedaled around the city with a couple of their friends who live in San Francisco (one, happened to be within walking distance of their hotel). 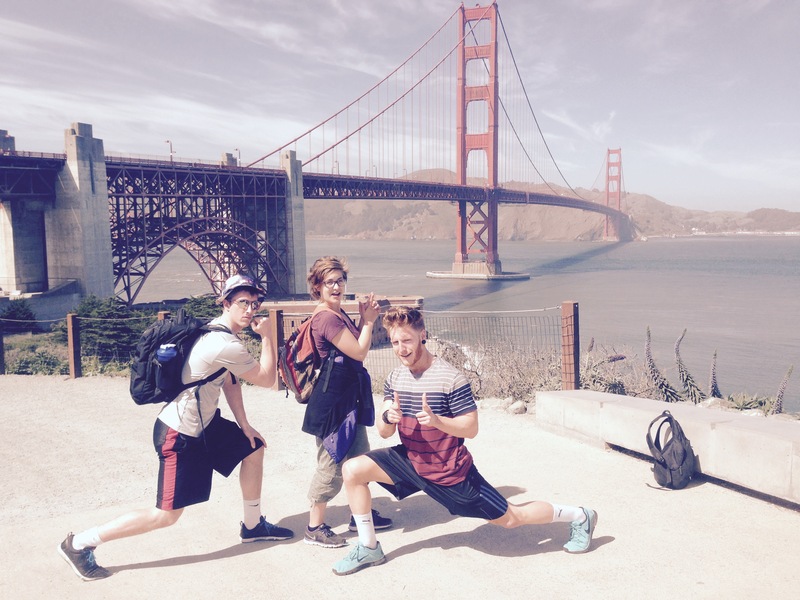 Below they are pictured by the Golden Gate Bridge, with their friend Sarah (originally from our home town) who now lives in San Francisco. In advance of their trip and training I decided to acquire the audio program “How to Win Friends and Influence People – In the Digital Age.” It has all the principles from the original program, but applied to our current world which involves the latest communication technologies: email, Facebook, video conferences, etc. Whether or not you’ve read the original (first published in 1937) or not, this is a must read (or listen to) for anyone wishing to take their career or personal life to the next level. No joke! So, the boys are now back and ready to apply their newly developed “super powers” of interpersonal management skills at school, work and their personal lives. Remember, this is a never-ending process. That is, most of us bathe every day, whether we need it or not 🙂 It is just as important (maybe more-so) to provide our minds with positive input and instruction – EVERY DAY! Your boys had an amazing experience and I’ll bet money they showed the “old guys” a thing or two. You must be very proud of them. Thanks Craig M. You are 100% correct!